The Break-A-Way Curtain system replaces traditional hooks and pins with the IFC-69 curtain track and safety tabs to keep patients, inmates, and other at-risk individuals safe. Add or remove safety tabs to control breakaway action. Ideal for correctional institutions, psychiatric wards, detention centers and other places where dealing with residents requires extra attention. All tracks come with non-removable end-stops. 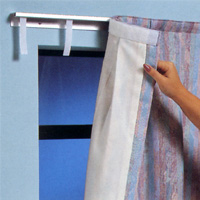 Pick up a set of Break-a-way Curtains today and keep your community safe.